A mass die-off of wild antelopes in Kazakhstan was triggered by environmental factors, scientists believe. More than 200,000 saiga antelopes collapsed and died suddenly in 2015, wiping out most of the global population. The deaths were found to be caused by a bacterial infection. However, new data shows other factors were involved too, including unusually high humidity and temperatures. Researchers think changing environmental conditions could be a trigger for the bacterial onslaught, although this needs further research. They say there is a high chance of the same thing happening again, given climate change predictions for the region. Study leader Prof Richard Kock of the Royal Veterinary College London was part of the original emergency response team. He said the event went way beyond what would normally be expected from a bacterial disease of this kind. "The whole thing was really extraordinary," he said. "It's very very likely to happen again." The multi-disciplinary team used statistical analysis to look at environmental conditions at the time. They found that there were unusually warm temperatures and high humidity in the days leading up to the wildlife deaths. The same was found for two previous mass die-offs of antelopes in 1981 and 1988 in central Asia. The mechanisms by which climate factors triggered this bacterial attack remain unknown, and require future research, they say. A link with climate had been noted before, but, "this is the first concrete evidence", said Prof Kock. There is an urgent need for mitigation of other risks to the critically-endangered animal, such as poaching and the spread of diseases from livestock, he added. "There's theoretically a possibility of extinction of the species entirely," he said. "We have at least got a number of populations - albeit small ones - that are outside the danger zone." Other wildlife, such as reindeer, could also be susceptible to mass die-offs, scientists believe. 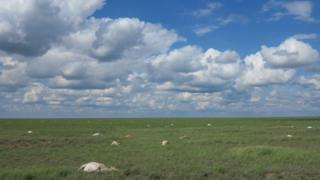 The antelopes all died within days of each other over a large area of central Kazakhstan. It later emerged that the most likely cause was blood poisoning from a bacterium found naturally in saiga antelopes, which is usually harmless. Co-researcher Steffen Zuther of the Frankfurt Zoological Society/Association for the Conservation of Biodiversity of Kazakhstan said mass mortality events are a major threat for the saiga antelope and can wipe out many years of conservation work in a few days. "The triggering of such mass mortality events in saiga through weather conditions shows that not much can be done to prevent them occurring, and therefore how important it is to maintain saiga populations of sufficient size for the species to survive such catastrophes," he explained. "The event was simply catastrophic for the long-term survival of this critically endangered species," said Nida Al Fulaij of the wildlife charity, PTES, which funded some of the rescue work. The saiga antelope lives on the grasslands of Central Asia in large herds of up to a thousand individuals. The International Union for the Conservation of Nature says the animal is at risk from illegal hunting for horns used in Chinese traditional medicine, as well as from habitat loss and grassland fires.